Known for its “haunted” town square and its incredible nightlife, Ellicott City in Maryland has a rich history that stretches all the way back to the founding of our nation’s current capitol city. If you’re looking for a house painter that can add a little character to your Howard County home, you’re looking in the right spot. From pre-sale interior painting to cabinet decoration and accents, our Maryland interior painters are always looking for the next challenge. We are the professional painting service that homeowners in Ellicott City go to when they want an interior paint job that accentuates the unique character of their beautiful homes and apartments. 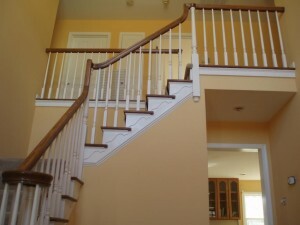 All Painting and Power Washing has the very best Interior Painting in all of Ellicott City MD! When Should You Paint Your Ellicott City Home? Some home improvement projects require a great deal of planning and assessment before you can begin them. Kitchen renovations, adding a garage or another room, even re-finishing a bathroom – all have to be carefully planned since they can cost thousands of dollars and they require a particular room in your home to be “out of service” during the length of the renovation. On the other hand, house painting is relatively quick, cheap, and our professional painters can have your rooms painted in as little as a day from start to finish. If you are looking for a simple way to change things up a little bit, interior painting might be for you. The impact of interior painting is huge, and it’s not nearly as permanent as other design decisions that you make with your house. If you regret the installation of a backyard pool, there isn’t much that you can do to cheaply fix it – but house painting can always be done and redone until you are satisfied. Many homeowners paint the rooms in their homes several times throughout their lives – changing the colors as new colors come into style or as their personalities change. Using bold and bright colors throughout your entire home can lead to fatigue – making it hard to focus on elements of your décor and detracting from the peaceful sense of luxury that you are trying to cultivate. The best use of color is sparingly, making color work for you by accentuating architectural elements and special rooms rather than overwhelming your visitors with the entire rainbow all at once. For example, rather than painting an entire living room red, you might choose to leave the living room a light tan, with only the hearth of the fireplace painted red, or perhaps the trim around the windows. The possibilities are endless, and you can find tons of inspiration for your next interior painting project on the pages of home design forums or websites like Pinterest. We always recommend that you keep your exterior paint colors, as well as the overall tone of your neighborhood in mind when you are painting your house as well. One of the reasons that people move to Ellicott City is the rich historical property preservation that the citizens have undertaken – so if you have a historic house you might wish to keep the colors and the painting style as close as possible to the original intentions of the builders, saving your bold colors for window treatments and furniture. The one area in your home that you definitely want to stay away from “trendy” colors is your kitchen cabinets. Kitchen cabinets are one of the most labor intensive painting projects in your house – and it can take a full day for a crew to paint just the cabinets and their components. Since cabinets have to be completely taken apart in order to paint – it can also leave your kitchen a bit like a disaster area, with your kitchen supplies and your pantry temporarily relocated to somewhere else in the house. You don’t want to end up repainting your kitchen cabinets more than necessary, so pick a color that will be timeless and that will help with the resale value of your home. White cabinets are always in style, as are cabinets that are in neutral tones like grays and tans. You can usually get away with lightly colored cabinets depending on the style of your kitchen – but stay away from darker colors that show dirt easily and that end up looking dated in just a few years. Most of all, remember that your cabinets are unique among painted surfaces in that they are constantly handled and used – so keep a good portion of the paint that you use on hand in your garage or your basement in case you ever need to touch up a chipped cabinet or scratched surface. One of the best rooms to try out a new swathe of colors in is actually your bathroom! Most bathrooms are relatively small, yet they get more traffic than most other rooms in the house and are great canvases for bright colors without overwhelming the rest of the home. You have even more flexibility with your color selection if your bathroom has otherwise neutral tones – like white fixtures and white subway tile – and if your bathroom gets some natural light so you can really make the colors shine. As in other parts of your home, a few bathroom mirrors can redirect light in a way that makes your bathroom look far larger than it actually is. In 2014, the most commonly selected colors by interior design professionals are lighter shades of blue and green… and even purple. There is a definite design trend of people moving towards minimalism in all parts of their home, including the bathrooms, so light colors help a space feel more open and larger. If you have a cramped half bathroom that otherwise feels more like a closet than a bathroom, adding a light paint color and changing your fixtures to fixtures that are specifically designed for a small space can really open it up. You can also mix and match the colors of your paint with the colors that you use for tile backsplashes or for your shower curtain. Try using darker shades of the same basic hues to give your bathroom a cohesive style while still making every individual color pop out from the lighter background. You can call us at 443-790-7145 or complete the form below for a FREE Estimate on your Ellicott City Interior Painting project. A member of our All Painting and Power Washing team will be in touch soon.